Jan Ebeling has withdrawn Beth Meyer, Ann Romney, and Amy Ebeling’s Rafalca from the CDI4* Aachen as well as contention for the 2014 World Equestrian Games U.S. Dressage Team. Ebeling (Moorpark, Calif.) decided that the welfare of the 17-year-old Oldenburg mare was paramount and that it would be in the best interest of World Cup and 2012 Olympic Games veteran to retire from competition. The U.S. Dressage Team and Chef d’Equipe Robert Dover fully supports Ebeling in his decision to put Rafalca’s wellbeing above all else. 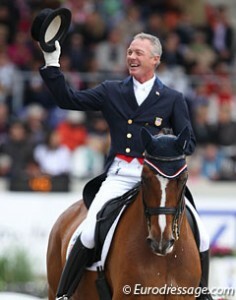 Members of the Short List for the 2014 World Equestrian Games U.S. Dressage Team head to Aachen, Germany to compete in CDIO5* and CDI4* competition, July 16-20.